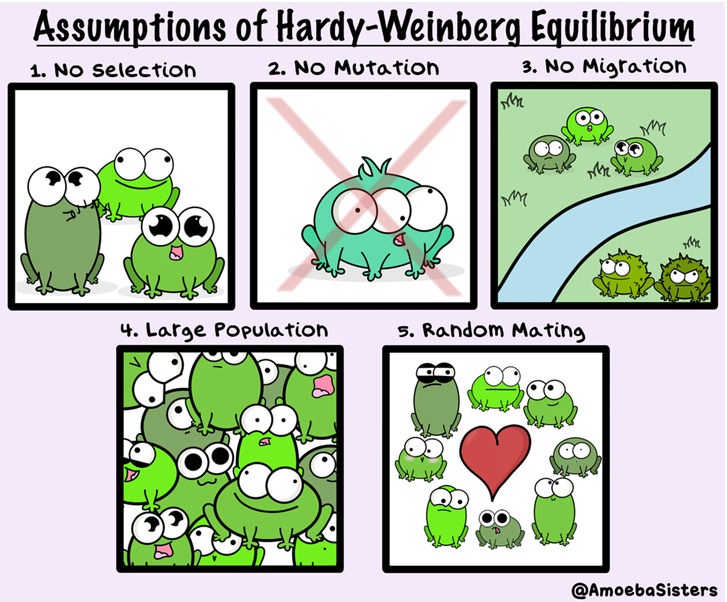 The Hardy-Weinberg equilibrium applies when a population is not subject to natural selection, mutations, genetic drift, genetic flow or non-random mating. In nature, populations are usually evolving, that is, the genetic make-up of any population is dynamic and changing over the course of many generations. One of the key ways that scientists study the evolution is to assess what a population looks like when it is not evolving, i.e. in an “idealised” state. This idealised population would follow the laws of the Hardy-Weinberg principle. Where p and q are two alleles at a particular locus in a population. 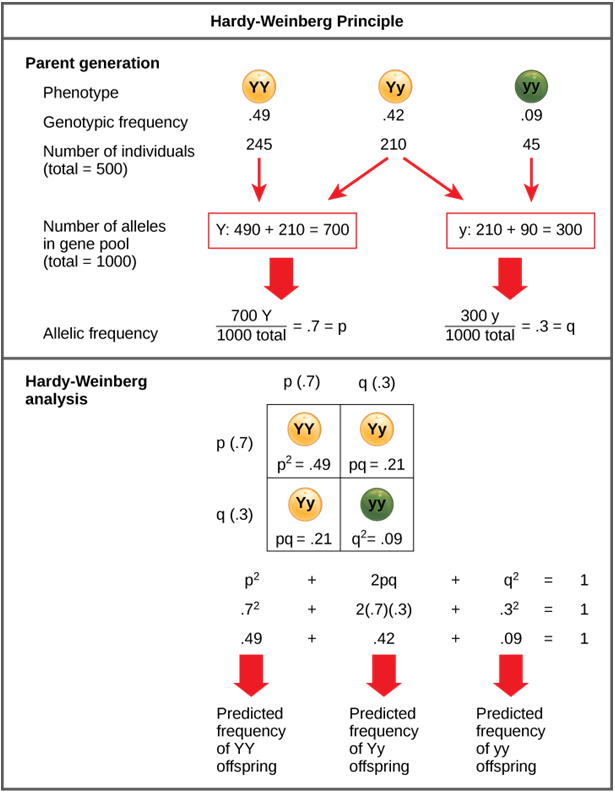 To understand the Hardy-Weinberg equilibrium, we first have to understand basic genetics. Initially, scientists thought that the inheritance of genetic information occurred by a ‘blending’ mechanism. In this process, offspring generated by the sexual reproduction of two individuals exhibit intermediates of the traits of each parent, just like the mixing of two colours in a cup. However, this is disputed under Darwin’s theory of natural selection, which relies on the existence of variable traits that are passed on to offspring, making them more likely to survive. In a blending system, this variation would be quickly lost. The blending theory was opposed by the famous pea plant experiments of Gregor Mendel, which showed that alternative alleles in a locus account for variations in inheritance. Each individual has two copies of each gene (i.e. is diploid). Each gamete (i.e. sperm or egg) only receives only one of these genes (alleles) that is to be passed on to the next generation. The selection of each allele is random, and so each copy of the gene has a 50% chance of being passed on to the next generation. Thus, we expect half of an individual’s gametes to contain one allele, and the other half to contain the other allele. We refer to the combination of two alleles the offspring receives at a particular locus as their genotype. If there are two alleles in a population at locus C, (allele C and allele c) then an individual could inherit all possible combinations to make their genotype (i.e. CC, cc or Cc. If an individual has CC or cc they are referred to as homozygotes, (two copies of the same allele), if they have the genotype Cc, they are heterozygotes (one copy of each allele). If the heterozygote (Cc) is phenotypically identical to one of the homozygotes, the allele found in the homozygote is said to be dominant, meaning this is the trait that is and the allele found in the other homozygote is recessive. That is, the effects of the recessive allele are masked by the effects of the dominant allele. The dominant allele is usually denoted with a capital letter, and the recessive allele with a lowercase letter. The allele frequencies in a population will not change from generation to generation. If the allele frequencies in a population with two alleles at a locus are p and q, then the expected genotype frequencies are p2, 2pq, and q2. This frequency distribution will not change from generation to generation when a population is in Hardy-Weinberg equilibrium. Natural selection – when an allele makes an organism more or less fit, changing the chances of survival and the chance that an organism will on the mutation to the next generation. Mutations – the source of all genetic variation. Without factors such as natural selection acting on a mutation, the rate of introduction of new alleles by mutation is actually quite low. Genetic drift – a non-infinite population size can cause large changes in allele frequencies because of chance events such as natural disaster. This factor is most prominent in small populations where sampling errors can occur. Genetic flow – the movement of genetic info from one population to another through physical movement of members of a population, transferring genetic material from one group to another and introducing new genetic variation rapidly. Because all of these disruptive forces commonly occur in nature, the Hardy-Weinberg equilibrium rarely applies in reality. It describes an idealised state, and genetic variations in nature can be measured as changes from this equilibrium state.